On behalf of all of us at the Amy Gillett Foundation we would like to thank you for your support over the last year, which has helped us to achieve many great things for cycling safety in Australia. Educate and raise awareness of cycling safety issues across Australia as the only national cycling safety organisation. 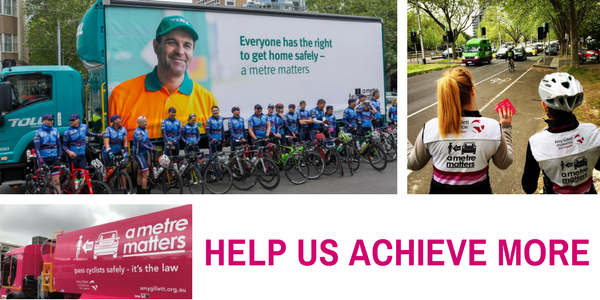 Please consider making an end of financial year donation to us to help us achieve uniform, consistent a metre matters laws across Australia, continue our invaluable research into road safety issues, and expand our education initiatives. After all, doesn’t everyone have the right to get home safely? Donations of $10 or $20 are wonderful, but gifts of $50, $100, or $500 will have a significant impact across our key strategic objectives in Education, Campaigns, Research and Technology. * Note that all donations of $2 and over are 100% tax deductible.